Even though email has taken over, fax machines are still an essential tool in business communication. Having a fax machine with excellent print quality and reliability is still incredibly important because there’s nothing more frustrating than an illegible or un-received fax. Teffont began as a fax service company some 30 years ago and is still considered as the UK’s number one fax machine sales, service and repair company. Our advisors are all specialists in their field; with their knowledge and experience, they will guide you through the different types of fax available, so that making the right choice is simple and hassle free. Our sales, service and repair packages are hard to beat and all demonstrate our commitment to being the UK’s number one fax company. We believe what sets Teffont apart from other fax sales companies is our attention to detail and the support that we offer to our customers, particularly in our after sales service. 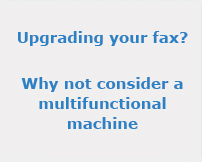 When you purchase a fax machine from Teffont you get more than just great advice and pricing. Thermal transfer fax machines: In order to print, thermal transfer technology uses heat to transfer ink from a ribbon onto a page of plain paper. Thermal transfer fax machines are fairly inexpensive and more common in the home-office market than true business fax machines. They can have a number of drawbacks, including mediocre print quality, noisy operation and very high running costs. If you receive more than a few faxes a day then consider an inkjet machine instead. Inkjet fax machines: Inkjet fax machines produce relatively crisp text at a low cost and make a good choice for low volume use, for example if you receive less than 20 faxes daily. There is a huge range of standalone and multifunctional devices that can print, copy and scan too. Be aware though that inkjet fax machines tend to have quite high running costs. For heavier usage requirements and faster print speeds, consider a laser fax machine instead. Laser fax machines: Heavy-duty fax machines use a laser or light emitting diode (LED) printing engine, with the same basic technology as laser printers. These laser fax machines use toner to quickly produce high-quality images on plain paper. Laser/LED printing is reliable and the machines commonly have advanced sending options. Although costing more to buy than inkjet or thermal fax machines their running costs are considerably lower.